Citation: Khamar B. Small cell carcinoma of the urinary bladder successfully managed with palliative radiotherapy and immunotherapy. Allied J Clin Oncol Cancer Res. 2018;1(1):12-16. Background: Small cell carcinoma of the bladder (SCCB) is a rare, poorly differentiated neuroendocrine epithelial tumour linked with a more assertive behaviour and poorer outcome than bladder transitional cell carcinoma (TCC). It is mostly diagnosed at last stage and generally believed to have a high metastatic potential. Case report: A 74 -year-old non-smoker man was having multiples episodes of gross hematuria for three months Had taken. The cystoscopical examination revealed a large mass over left lateral and anterior wall. Biopsy was taken and its evaluation revealed tumor to be small cell carcinoma. Patient had no recurrence till last follow up at two years. He died following last follow up due to cancer unrelated cause. The main aim is to describe the complete response without recurrence for two years (till cancer unrelated death) achieved in T4b stage large urinary bladder cancer using palliative radiation, 20 gy radiation(2 gy each) and TLR-2 agonist CADI-05. Conclusion: Probably the first case report describing successful bladder preserving approach using low dose (sub lethal) radiotherapy with active immunotherapy in management of T4b stage SCCB. Small cell carcinoma (SCC) represents approximately 20% of lung cancer . The extra pulmonary SCC is relatively rare . It has been described in esophagus, stomach, pancreas, gallbladder, uterine cervix, kidney, urinary bladder, and prostate [3,4]. SCC of urinary bladder (SCCB) has a morphology similar to SCC of the lung . The primary SSCB is seen in less than 1% of bladder cancer [4-9], mostly in patients with a history of heavy smoking . Unlike transitional cell carcinoma of bladder, SSCB is highly aggressive and is rare to find lower stage disease at initial diagnosis [4,9,10]. SCCB is known for rapid progression, early metastases, and poorer prognosis compared to transitional cell of bladder [7-10]. The National Comprehensive Cancer Network’s guidelines 2018 (NCCN) recommends neo-adjuvant chemotherapy followed by cystectomy or radiotherapy for any patient with small-cell component histology with localized disease regardless of stage . There is no specific recommendation provided for management of T4b stage bladder cancer with small cell component histology [SCCB] in NCCN. For stage T4b disease in general, systemic therapy (chemotherapy) or concurrent chemo radiotherapy is recommended by NCCN [11,12]. EAU 2016 guidelines recommend radical cystectomy as a palliative treatment for stage T4b disease . Radical surgery has the greatest morbidity and should be considered only if there are no other options . Radiation therapy can be used to control hemorrhage and pain . An analysis of 960 SCCB patients in the National Cancer Data Base revealed that median overall survival (OS) was 8.3 months . The case report describes complete response without recurrence for two years (till cancer unrelated death) achieved in T4b stage large urinary bladder cancer using palliative radiation, 20 gy radiation(2 gy each) and TLR-2 agonist CADI-05 [14-16]. Achieving complete response in absence of surgery for T4b stage SCCB is not a known possibility. In the light of our case report, we also discuss potential mechanism of action on based on systematic literature review. A 74 -year-old non-smoker man was having multiples episodes of gross hematuria for three months. He had no other symptoms like pain, burning micturition, weight loss or night sweats. He had no risk factors including previous radiation therapy, occupational risk factors or hereditary factors. In addition, no other pre-existing conditions were known. The performance status (PS) was equal to 1. Ultrasound evaluation revealed a mass in bladder. Ultrasound evaluation of abdomen did not reveal any abnormality. Contrast enhanced computed tomography (CT) scan of the pelvis showed a bladder mass at left wall and anterior wall measuring 8.9 × 7.6 cm with extra vesicle extension to left rectus abdominal muscle without enlargement of the pelvic lymph nodes (Figure 1). The cystoscopical examination revealed a large mass over left lateral and anterior wall. Biopsy was taken and its evaluation revealed tumor to be small cell carcinoma. The patient received 10 sittings of radiation (2 gy each) as a palliative therapy. After five sittings of radiotherapy, immunotherapy was added. Immunotherapy comprised of CADI-05 (Potent TLR 2 agonist) and was administered intradermally over deltoid. The first dose of 0.2 ml was administered over both detours. Subsequently 0.1 ml was administered every two weeks. Hematuria disappeared following first administration of CADI-05 and prior to second administration of CADI-05. Ultrasound repeated six weeks later failed to reveal mass lesion. Bladder wall thickness of 9 mm was the only finding. Contrast enhanced CT scan suggested remission of mass to the great extent (Figure 2). 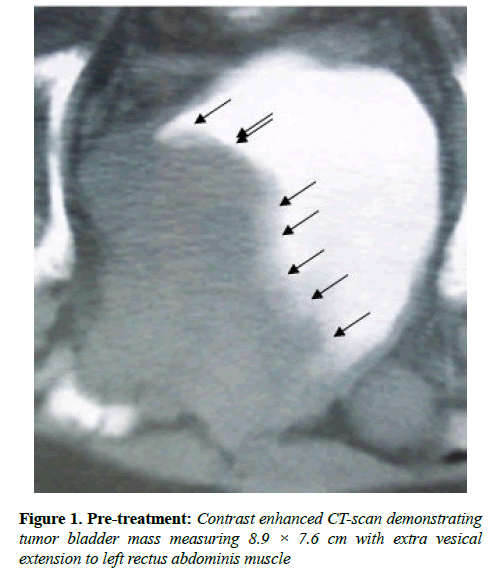 Subsequent contrast enhanced CT scans did not reveal any mass lesion (Figure 3). Figure 3: Absence of Tumor following treatment. Patient had no recurrence till last follow up at two years. He died following last follow up due to cancer unrelated cause. There is a synergy between radiotherapy and immunotherapy [17-23]. Combination therapy while improving outcome also generates strong protective response to provide resistance to recurrence . Synergy does not need tumor to be immunogenic and is also seen in absence of antigen sharing between tumor and immunotherapy [24,25]. Underlying mechanism of synergy is due to complex effect of radiotherapy on tumor cells, tumor microenvironment and vessels [17,23,26,27]. Effect on tumor cells make them more sensitive for cytotoxic T cell responses, due to an increased expression of immunogenic surface molecules like adhesion molecules (ICAM-1), death receptors(Fas/CD95), classical stimulatory molecules (MHC I), costimulatory molecule (CD80), mannose 6phosphate receptor etc. [17,18,25,28-32]. As concerns the tumor microenvironment, RT triggers the timely restricted release of many pro-inflammatory molecules such as chemokines, cytokines, and immune-activating danger signals (DAMPs) as well as exosomes . This effect is seen even with sub lethal radiation [32-34]. Up regulation of surface proteins leads to sensitization of tumor cells killing by immune cells [17,25,28,33,34] mainly CTL . Radiation also induces tumor specific cytotoxic T lymphocytes (CTL) [17,18]. Radiation facilitates infiltration of immune cells into tumor [23,26,27,35,36] by up regulation of chemokines CXCL9, CXCL10, and CXCL16 . Tumor infiltration by T cells is also facilitated by up regulation of vascular cellular adhesion molecule 1 (VCAM-1) on tumor endothelium . Radiation-induced up-regulation of surface proteins on surviving tumor cells improves their recognition and killing by T cells . Radiation also induces immunosuppression. It promotes accumulation of regulatory T cells (Treg) and protumorigenic M2 macrophages . CADI-05 is a potent Toll like Receptor-2 (TLR-2) agonist [15,16] which induces a potent Th1 type of cell mediated immune response even in presence of tumor [38,39]. Immune response generated is adaptive in nature and its cytotoxic activity is mediated by CD8+ cells secreting IFN gamma . Following intradermal or subcutaneous administration of CADI-05, there is a significant increase in tumor infiltrating cells which includes IFN-gamma secreting CD4 cells, CD8 cells, NK cells, NKT cells, dendritic cells and macrophages . CADI-05 also reduces tumor induced cell mediated immunosuppression by reducing the number of Treg, CTLA-4 and PD-1 expressing lymphocytes and M2 macrophages [38-41]. CADI-05 administration also reduces production of immunosuppressive cytokines like IL-6, IL-10, and TGF-beta [39-41]. The administration of CADI-05 to small-size tumor-bearing animals results in delayed tumor progression with improved survival but has no effect on larger tumor [38,40]. CADI-05 is found to be synergistic with chemotherapy, radiotherapy and monoclonal antibodies targeting immune check point [36,38]. CADI-05 along with chemotherapy is found useful in management of non-small cell lung cancer [15,40]. It improves response rate, progression free survival and overall survival in those completing four cycles of chemotherapy. CADI-05 with radiotherapy is found useful in management of muscle invasive bladder cancer also [42,43]. It achieves complete response which is durable. As a monotherapy CADI-05 is found useful in management of advanced melanoma . It is approved in India for use with chemotherapy in management of advanced non-small cell lung cancer. The possible mechanism based on current knowledge seems to be synergy between sensitizing effect of radiation for immune mechanism mediated killing and Th1 type of cell mediated immune response generated by CADI-05. Both activates immune cells and potentates their infiltration in tumor. Both work mainly through IFN-gamma secreting CD8+ T cells. CADI-05 also reduces Trig and known to convert M2 macrophage to M1 type. This is probably the first case report describing successful bladder preserving approach using low dose (sub lethal) radiotherapy with active immunotherapy in management of T4b stage SCCB. Chan BA, Hughes BGM. Targeted therapy for non-small cell lung cancer: current standards and the promise of the future. Transl Lung Cancer Res. 2015;4(1):36-54. Ahsaini M, Riyach O, Tazi MF, et al. Small cell neuroendocrine carcinoma of the urinary tract successfully managed with neoadjuvant chemotherapy. Case Rep Urol. 2013;2013:598325. Kim JH, Lee S-H, Park J, et al. Extra pulmonary small-cell carcinoma: a single-institution experience. Jpn J Clin Oncol. 2004;34(5):250-4. Ismaili N. A rare bladder cancer-small cell carcinoma: review and update. Orphanet J Rare Dis. 2011;6:75. Blomjous CE, Vos W, De Voogt HJ, et al. Small cell carcinoma of the urinary bladder. A clinicopathologic, morphometric, immunohistochemical, and ultrastructural study of 18 cases. Cancer 1989;64(6):1347-57. Lopez JI, Angulo JC, Flores N, et al. Small cell carcinoma of the urinary bladder. A clinicopathological study of six cases. Br J Urol. 1994;73(1):43-49. Holmäng S, Borghede G, Johansson SL. 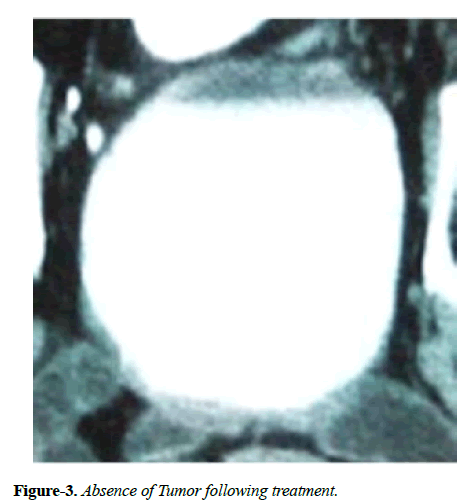 Primary small cell carcinoma of the bladder: a report of 25 cases. J Urol. 1995;153(6):1820-2. Geynisman DM, Handorf E, Wong Y-N, et al. Advanced small cell carcinoma of the bladder: clinical characteristics, treatment patterns and outcomes in 960 patients and comparison with urothelial carcinoma. Cancer Med. 2016;5(2):192-9. Kaushik D, Frank I, Boorjian SA, et al. Long-term results of radical cystectomy and role of adjuvant chemotherapy for small cell carcinoma of the bladder. Int J Urol Off J Jpn Urol Assoc. 2015;22(6):549-54. Ismaili N, Ghanem S, Mellas N, et al. Small cell carcinoma of the urinary bladder: a case report and review of the literature. J Cancer Res Ther. 2009;5(2):133-6. Alfred Witjes J, Lebret T, Compérat EM, et al. Updated 2016 EAU Guidelines on Muscle-invasive and Metastatic Bladder Cancer. Eur Urol. 2017;71(3):462-75. Flaig T, Spiess P, Agarwal N, et al. NCCN Clinical Practice Guidelines in Oncology : Bladder Cancer Version 3. 2018,NCCN, 2018. Witjes JA, Compérat E, Cowan NC, et al. EAU guidelines on muscle-invasive and metastatic bladder cancer: summary of the 2013 guidelines. Eur Urol. 2014; 65(4):778-92. Pandey RK, Sodhi A, et al. Mycobacterium indicus pranii mediates macrophage activation through TLR2 and NOD2 in a MyD88 dependent manner. Vaccine 2012; 30(39):5748-54. Kumar P, Tyagi R, Das G, Bhaskar S. Mycobacterium indicus pranii and Mycobacterium bovis BCG lead to differential macrophage activation in Toll-like receptor-dependent manner. Immunology 2014;143(2):258-268. Belani CP, Chakraborty BC, Modi RI, et al. A randomized trial of TLR-2 agonist CADI-05 targeting desmocollin-3 for advanced non-small-cell lung cancer. Ann Oncol Off J Eur Soc Med Oncol. 2017;28(2):298-304. Demaria S, Bhardwaj N, McBride WH, et al. Combining radiotherapy and immunotherapy: a revived partnership. Int. J. Radiat Oncol Biol Phys. 2005;63(3):65566. Frey B, Rubner Y, Kulzer L, et al. Antitumor immune responses induced by ionizing irradiation and further immune stimulation. Cancer Immunol Immunother. CII 2014; 63(1):29-36. Takeshima T, Chamoto K, Wakita D, et al. Local radiation therapy inhibits tumor growth through the generation of tumor-specific CTL: its potentiation by combination with Th1 cell therapy. Cancer Res. 2010;70(7):2697-706. Graf MR, Prins RM, Hawkins WT, et al. Irradiated tumor cell vaccine for treatment of an established glioma. I. Successful treatment with combined radiotherapy and cellular vaccination. Cancer Immunol Immunother. CII 2002;51(4):179-89. Lumniczky K, Desaknai S, Mangel L, et al. Local tumor irradiation augments the antitumor effect of cytokine-producing autologous cancer cell vaccines in a murine glioma model. Cancer Gene Ther. 2002;9(1):44-52. Chakraborty M, Abrams SI, Coleman CN, et al. External beam radiation of tumors alters phenotype of tumor cells to render them susceptible to vaccine-mediated T-cell killing. Cancer Res. 2004;64(12):4328-37. Ganss R, Ryschich E, Klar E, et al. Combination of T-cell therapy and trigger of inflammation induces remodeling of the vasculature and tumor eradication. Cancer Res. 2002;62(5):1462-70. Mason KA, Ariga H, Neal R, et al. Targeting toll-like receptor 9 with CpG oligodeoxynucleotides enhances tumor response to fractionated radiotherapy. Clin Cancer Res Off J Am Assoc Cancer Res. 2005;11(1):361-9. Kim S, Ramakrishnan R, Lavilla-Alonso S, et al. Radiation-induced autophagy potentiates immunotherapy of cancer via up-regulation of mannose 6-phosphate receptor on tumor cells in mice. Cancer Immunol Immunother. CII 2014;63(10):1009-21. Nikitina EY, Gabrilovich DI. Combination of gamma-irradiation and dendritic cell administration induces a potent antitumor response in tumor-bearing mice: approach to treatment of advanced stage cancer. Int J Cancer 2001;94(6):825-33. Hallahan DE, Staba-Hogan MJ, Virudachalam S, et al. X-ray-induced P-selectin localization to the lumen of tumor blood vessels. Cancer Res. 1998;58(22):5216-20. Chakraborty M, Abrams SI, Camphausen K, et al. Irradiation of tumor cells up-regulates Fas and enhances CTL lytic activity and CTL adoptive immunotherapy J Immunol Baltim Md 1950 2003;170(12):6338-47. Klein B, Loven D, Lurie H, et al. The effect of irradiation on expression of HLA class I antigens in human brain tumors in culture. J Neurosurg. 1994;80(6):1074-77. Santin AD, Hiserodt JC, Fruehauf J, et al. Effects of irradiation on the expression of surface antigens in human ovarian cancer. Gynecol. Oncol. 1996;60(3):468-74. Vereecque R, Buffenoir G, Gonzalez R, et al. gamma-ray irradiation induces B7.1 expression in myeloid leukaemic cells. Br J Haematol. 2000;108(4):825-31. Garnett CT, Palena C, Chakraborty M, et al. Sublethal irradiation of human tumor cells modulates phenotype resulting in enhanced killing by cytotoxic T lymphocytes. Cancer Res. 2004;64(21):7985-94. Morisada M, Moore EC, Hodge R, et al. Dose-dependent enhancement of T-lymphocyte priming and CTL lysis following ionizing radiation in an engineered model of oral cancer. Oral Oncol. 2017;71:87-94. Cacan E, Spring AM, Kumari A, et al. Combination Treatment with Sublethal Ionizing Radiation and the Proteasome Inhibitor, Bortezomib, Enhances Death-Receptor Mediated Apoptosis and Anti-Tumor Immune Attack. Int J Mol Sci. 2015; 16(12):30405-21. Hallahan D, Kuchibhotla J, Wyble C. Cell adhesion molecules mediate radiation-induced leukocyte adhesion to the vascular endothelium. Cancer Res. 1996; 56(22):5150-55. Ryschich E, Harms W, Loeffler T, et al. Radiation-induced leukocyte adhesion to endothelium in normal pancreas and in pancreatic carcinoma of the rat. Int J Cancer 2003;105(4):506-11. Formenti SC, Demaria S. Combining radiotherapy and cancer immunotherapy: a paradigm shift. J Natl Cancer Inst. 2013;105(4):256-65. Ahmad F, Mani J, Kumar P, et al. Activation of anti-tumor immune response and reduction of regulatory T cells with Mycobacterium indicus pranii (MIP) therapy in tumor bearing mice. PloS One 2011;6(9):e25424. Rakshit S, Ponnusamy M, Papanna S, et al. Immunotherapeutic efficacy of Mycobacterium indicus pranii in eliciting anti-tumor T cell responses: critical roles of IFNγ. Int J Cancer 2012;130(4):865-75. Banerjee S, Halder K, Ghosh S, et al. The combination of a novel immunomodulator with a regulatory T cell suppressing antibody (DTA-1) regress advanced stage B16F10 solid tumor by repolarizing tumor associated macrophages in situ. Oncoimmunology 2015;4(3):e995559. Das S, Halder K, Goswami A, et al. Immunomodulation in host-protective immune response against murine tuberculosis through regulation of the T regulatory cell function. J Leukoc Biol. 2015;98(5):827-36. Pant M, Chakraborty BS, Patel N, et al. Role of Cadi-05 as an adjuvant therapy in advanced non small cell lung cancer. J Thorac Oncol.] 2007;2(8):S616. Chaudhuri P, Mukhopadhyay S. Bladder preserving approach for muscle invasive bladder cancer--role of mycobacterium w. J Indian Med Assoc. 2003;101(9):559-60. Mosca, P, Nair S, Ayre S, et al. Immunologic Therapy with Cadi-05 for the Treatment of Advanced Melanoma. 2010.